If you’re looking to Asia for your next holiday Indonesia offers a good mix of natural retreats and ancient, religiously important spots to head to. There are excursions to active volcanoes to make, coffee or clove plantations to explore and walks through the enticingly charming local villages and tropical countryside. There’s so much more to see in the ethnically varied islands of Indonesia but if you plan to start with a trip it’s great to begin by visiting the Lake Toba on Sumatra Island. A historical testimonial to a massive volcanic eruption that left only several thousand survivors the volcano lake is immensely spread through a length of 100 kilometers being as wide as 30 kilometers. There’s an island- the Pulau Samosir in the center of this lake believed to be the largest island that’s located inside an island. A lot of people like to visit the two lakes on this central island for a relaxing time and a swim. Another destination within Indonesia that you’d like to see is Gunung Bromo. It’s actually a volcano that’s still active and has a top that is blown off. White smoke constantly comes out of the volcano and the scenically lush mountains can be spotted on one side, with the sea-of-sand surrounding the volcano forming a fine backdrop. When in Indonesia you should plan a trip to the Baliem valley that offers a completely unique glimpse into what can be termed as the modern day survivor of the ancient, stone-age civilization. Start from Wamena to reach this highland in west New Guinea. You’re sure to marvel at the tribal culture nestled in absolutely untouched natural backdrop replete with rivers gushing down the mountains. It is in South Sulawesi that the Toraja people inhabit the highlands. The homes built by the Torajas are evidence of their spectacularly skilful and talented culture. The Torajas still follow many of the ancient myths and ways of life characteristic of the region. Getting a close look at their lifestyle, dances and homes is a treat to the eye! Walking to the hilly slopes to their villages is so much fun. But if it’s a holiday along the beach that you prefer then check out the Gili islands in Lombok region of Indonesia. There are cosy beachside cafes and an engulfing peace to bask in. There is also Bunaken on the northern periphery of Sulawesi. It undoubtedly has the best diving and snorkeling setup in Indonesia. An astonishing density of 70% of west-Pacific’s fish species can be spotted here underwater. 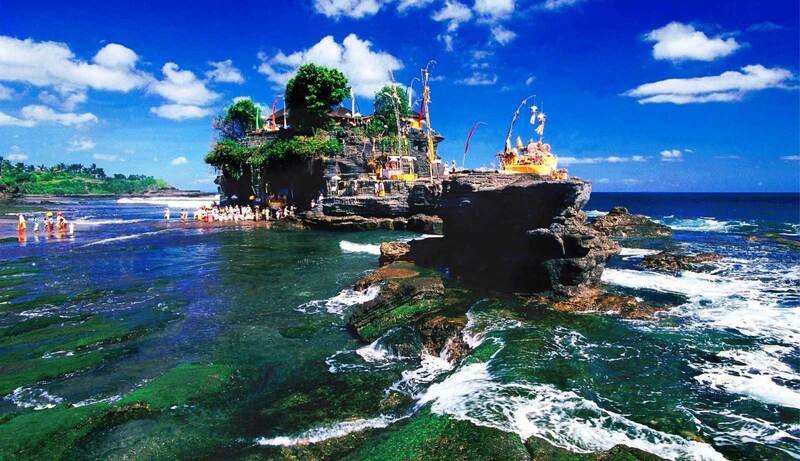 Once your sea-side holidaying is done do visit the famous Buddhist temple on Java. Borobudur is a 8th century relic that has survived the encroaching boundaries of the surrounding forest. For those who need their holidaying dose of wildlife there is the Tanjung Putting national park in the Borneo Island on Central Kalimantan and the Komodo national park inside the islands of Lesser Sunda. You can watch at a close range the earth’s largest surviving reptile- Komodo dragon. And once your rendezvous with the different faces of Indonesia is complete do remember to spend some time in the rugged landscape of Bali where many visually magnificent delights await you. Kerala: Experience The Nuances Of A Real Backwaters Adventure!